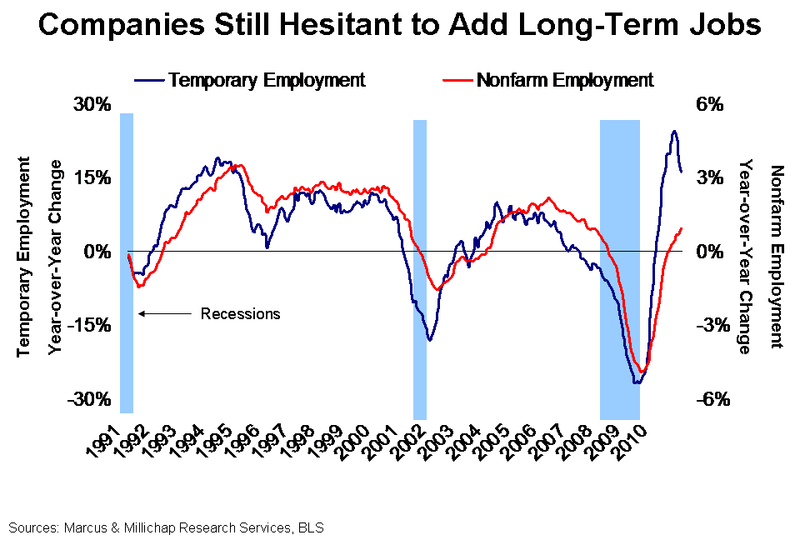 Corporate America added fewer permanent jobs than expected in December and remained reliant on temporary workers to meet staffing needs. Private-sector employers, however, show signs a sustainable, albeit cautious, rate of expansion has taken hold, and recent government action could accelerate the pace of hiring in 2011. This clarity in the regulatory environment and strengthening corporate balance sheets will begin to erode hesitation in the first half. As private-sector investment becomes increasingly confident, the rate of employment growth will accelerate even as government stimulus fades. The addition of 113,000 private-sector jobs in December offset the loss of 10,000 government positions, bringing total employment growth for the first calendar year following the recession to 1.1 million, well ahead of the pace of hiring in the year proceeding the last two recessions. While the net December job figure fell short of expectations, the national unemployment rate managed a 40 basis point decline to 9.4 percent. The retraction reflects a reduction in the labor market, rather than employment gains, as early double the recorded job growth typically is required to lower unemployment. Nonetheless, December marked the 12th consecutive monthly increase in the private sector, resulting in a gain of 1.3 million nongovernment jobs in 2010, a reversal for the economy, which lost nearly 8.5 million private-sector jobs in 2008 and 2009. Furthermore, private-sector job creation in the final three months of 2010 totaled the largest quarterly gain for the year, a vital indication corporate America is finally gaining confidence. In December, job creation took root across a greater number of industries, with seven of 11 employment sectors registering an increase, up from five sectors one month earlier, signifying a broadening recovery. December employment gains were led by the leisure and hospitality sector, where 47,000 positions were added, as business and leisure travel increased hotel room demand by 8 percent in 2010. The manufacturing sector added 10,000 jobs in the final month, ending a four-month streak of contraction. Industry surveys indicate more gains in the sector should emerge in the first half of this year. Hard-hit retail sectors such as food establishments will demonstrate greater stability as re-employed consumers resume dining out. Several encouraging signs surfaced last year, including the addition of 188,400 workers in food service and drinking establishments. In addition, retail sales recently surpassed pre-recession levels, reflective of strengthened consumer confidence. During 2011, recovering economic conditions will continue to ease job security concerns and lift consumer confidence, which will bolster shopping traffic and fuel an incremental recovery in retail operations. After stabilizing at 10.2 percent last year, the U.S. retail vacancy rate is anticipated to improve 20 basis points in 2011. After staging a better-than-expected vacancy recovery in 2010, a twofold increase in U.S. employment figures in 2011 will meet with unprecedentedly low multifamily completions, driving the national apartment vacancy rate below the long-term average. Absorption levels will rise to approximately 148,000 units in 2011, pushing down apartment vacancy 100 basis points to 5.6 percent, mirroring last year’s drop. This entry was written by marcusmillichap, posted on January 11, 2011 at 3:03 am, filed under Research and tagged Employment. Bookmark the permalink. Follow any comments here with the RSS feed for this post. Trackbacks are closed, but you can post a comment. Your arguements for recovery are so bad you have convinced me we are now going to have another recession.